There are two times of the year for Fishermen and women, Fishing Season and Waiting for Fishing Season. Luckily, it’s Fishing Season! Are you interested in l earning about fishing in this area from a local fisherman? 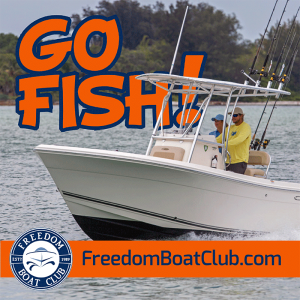 Bring a lawn chair and come on over to the Freedom Boat Club at Harbourgate Marina in North Myrtle Beach for a Fishing Info Session with Capt. Patrick Kelly – “Smiley” with Captain Smiley’s Fishing Charters. Captain Patrick Kelly – “Smiley” grew up on the waters in this area but little did he know that his hobby would become a lifelong commitment to fishing, conservation and being a good steward to his hometown. Capt. Smiley is a light tackle specialist and Inshore fishing is his specialty. He is sure to make you smile with all his fishing tips! Bring a lawn chair, as seating will be limited, and meet us on the Ship Store side of the Harbourgate Marina. (by the fuel dock) Refreshments will be provided by Freedom Boat Club for your enjoyment. You do not have to be a member to join us, so bring a friend.